For many of the world’s industries, 2016 was a year to forget. With surprise election results and sweeping rebalances of diplomatic relations, businesses were caught off guard, lacking the information needed to make crucial decisions. Whether businesses liked it or not, inaction was often the only sensible choice during a year when it felt like anything was possible. But in the world of foreign currency trading, this situation proved to be an exciting playground for firms of every size. Such an environment provided the diplomatic jostling and policy swings that gave foreign exchange traders plenty of opportunities to turn a profit. As the global economy enters one of the most uncertain periods for many years, the moments traders can take advantage of will only continue to emerge. As an industry that sees as much as $5.1trn in trades every single day, overlooking the potential of the foreign exchange market would be a mistake. Though filled with opportunities, this environment only rewards the best and bravest traders who are able to anticipate changes and interpret the market better than anyone else. Currencies continue to soar and sink, and while opportunities are out there, it takes a talented forex trader to notice the minute details that can inform a profitable decision. In this exciting time, World Finance’s panel of experts has set out to find the current leaders in the forex industry. The firms listed in the World Finance Forex Awards 2017 have the potential to take the current wave of uncertainty in their stride and use it to their advantage. For forex traders, 2016 didn’t start out particularly positively. Warnings were raised that liquidity in the market was drying up, with both investors and banks instead favouring faster trades and avoiding substantial risks. Between October 2014 and October 2015, currency trading in the UK and North America shrank by more than 20 percent, Bloomberg reported. With a lack of volatility, many traders had little to work with. Another factor making currency trading far more difficult was the increased speed markets now operate at. Whereas a change in government policy may have once taken months to fully play out on markets, it now takes mere seconds. Wild spikes and slumps are now common, meaning that traders need to either work faster, or embrace a far more long-term perspective. But despite these early difficulties, 2016 soon livened up. The UK’s vote to leave the European Union had the knock-on effect of rejuvenating the forex sector, with trading desks suddenly kicked into overdrive. The Financial Times reported that, on the first day of trading after the vote, desks handled as much as 10 times their normal volumes, with many reporting that it was their busiest ever day on the job. As the Brexit negotiations continue to play out and specific details gradually emerge, traders will find plenty of opportunities with which to make some gains. are right in their element. After the previous year had set the stage, 2017 started with a surge of ups and downs for the global market. With the Brexit process officially triggered and a surprise election adding to the chaos in the UK, both the pound and the euro are set for a rocky ride. Traders can expect every tiny negotiation detail that inevitably leaks out to have a significant impact on both short and long-term trades. The US economy also presents significant opportunities for forex traders as Trump continues to make his moves. As his first few months in office have already shown, the president is not beyond completely reversing his policies, and while the tremendous instability this causes may be problematic for some, forex traders with a keen eye may be able to take advantage of the opportunities others overlook. Of particular note to traders should be Trump’s commitment to deregulate financial markets, particularly with regards to the Dodd-Frank Act. When signed into law in 2010, Dodd-Frank led to the closure of many smaller US-based forex businesses that were unable to maintain new minimum capital levels. But if capital requirements were to be eased, as is expected, smaller foreign brokers could soon return to US shores and shake up the market. There is even potential for new companies to be created from scratch, something that has been more or less impossible over the past few years. The expectation of further rate hikes by the US Federal Reserve is also poised to liven up the economy. With these forces looming on the horizon, it looks like the forex industry is set to become the most exciting it has been for a good long while. As with all elements of the financial services industry, automation and online trading are making business faster and more competitive. Artificial intelligence is now being used to develop extremely effective trading algorithms, which – with the right methodology behind them – can greatly affect a business’ performance. With these algorithms able to trade confidently against the most miniscule fluctuations in the market, even the swiftest trade can bear interesting results. For the classic human trader, a longer-term view is needed. With all the political and economic factors that have impacted markets recently – many of which came unexpectedly and without precedent – the opportunities for humans to make longer-term decisions still exist. While forex may be moving forward at an unbelievable pace, taking a moment to slow down and take stock of a situation remains a good idea. This is going to be necessary in the coming months as traders keep several potential factors in mind. Whether or not the Chinese economy will increase its growth rate this year will be playing on the minds of plenty, with growth likely to benefit commodity-based emerging markets. The possibility of cuts to OPEC members’ oil production is also a factor, as the price of oil continues to put pressure on many. The number of elections currently taking place in Europe could also produce significant change. While algorithms can respond to these situations well, a good human trader may have the intuition needed to make more pre-emptive moves. In such an exciting time for the industry, identifying the most innovative forex firms in the world has never been more important. 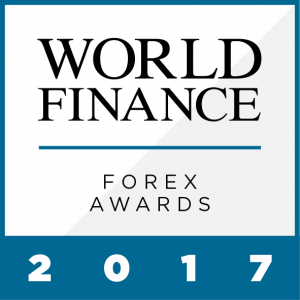 The winners of the 2017 World Finance Forex Awards have demonstrated exemplary leadership in their field, and are equipped with the tools needed to deal with the incredible challenges and opportunities that lie ahead. In an industry that has been rejuvenated so swiftly and suddenly, with the potential for an even stronger future, these forex industry leaders have a big role to play.